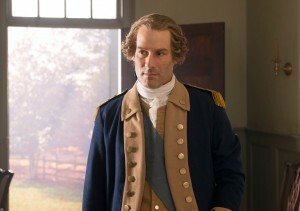 Ian Kahn as George Washington in “TURN: Washington’s Spies”. 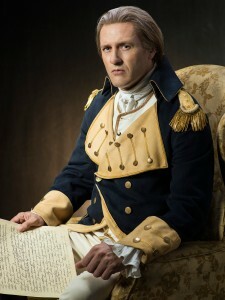 The three part miniseries Sons of Liberty came to a conclusion on January 27, 2015, with George Washington (portrayed here by Jason O’Mara), having also been portrayed in TURN: Washington’s Spies by Ian Kahn, lead a memorable moment at the end of the finale, leaving off the miniseries just after the signing of the Declaration of Independence. This ending left the miniseries with the potential for more in a full series, if History were to ever pick one up. Here are my reasons as to why I believe that they should. Other miniseries and series such as George Washington in 1984 and its sequel, George Washington II: The Forging of a Nation in 1986, starring Barry Bostwick in the titular role, as well as HBO’s John Adams in 2008 and the recent series TURN: Washington’s Spies, beginning in 2014 and renewed for a second season to air this spring, have been well received by various audiences. Sons of Liberty (if it were to become a series) and TURN: Washington’s Spies could both benefit each other, with audiences becoming more aware of the Revolutionary War with each series providing different aspects of the war. Sons of Liberty provided more of a focus on the Founding Fathers than TURN: Washington’s Spies, which includes George Washington and the Culper Ring. Jason O’Mara as George Washington in “Sons of Liberty”. Both series, despite some historical inaccuracies, could provide educational facts about our history than can further develop interests and teach their audiences facts and historical events that some may be unaware of. Historical series haven’t been as frequent as I believe they should be. History has something here with Sons of Liberty and a series order could be a step in bringing more audiences to have an interest in our history. With a viewership of 3.29 million people on the first episode, 2.83 million on the second and 3.30 million on the third, the series averages closely to History‘s Vikings. I feel that this series has to potential to be more, especially with the ending that it had and I hope that History considers it for a full series, as it and TURN: Washington’s Spies have been two of my favorite pieces of television and film in the last year. You can find information on Sons of Liberty and watch its three episodes for free here and learn more about TURN: Washington’s Spies here, at their official websites. Comments for Why “Sons of Liberty” Could Work as a Series are now closed.